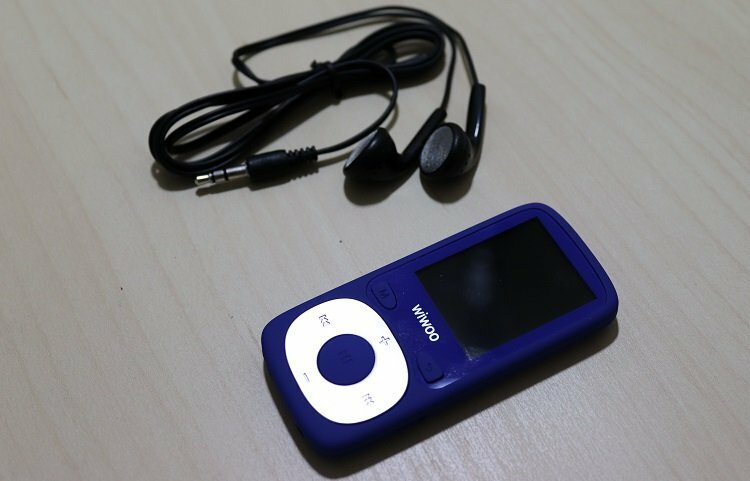 I recently purchased the Wiwoo B3 MP3 Player as an option for one of my kids. It’s available in 8GB and 16GB sizes and blue, silver, red, and black colors. This is one of 5 bestselling MP3 Players I purchased in this price range to see which one I think is best for around $25 to $35. Pricing is inexpensive at around $25 for the 8GB model and $35 for the 16GB. This review is one of 5 MP3 players we’re buying and reviewing as part of a series on the best portable MP3 players for kids. Wiwoo also has a B4 model that has a paw-shaped menu for young kids; however, this one is by far more popular. One of the main reasons I wanted to review this as well as other models is that there is a lot of misinformation about the quality, support, and exactly what you get with these items. As you can see the B3 comes with an armband, USB charging cable, earbuds, and an instruction manual. Now that you know the basics, let’s jump into the review. I was able to place 75 songs (564MB) on the B3 in about 2 minutes. All of the formats I used were MP3. I didn’t try the FLAC and APE for the lossless audio; however, that’s something that Wiwoo claims they support. 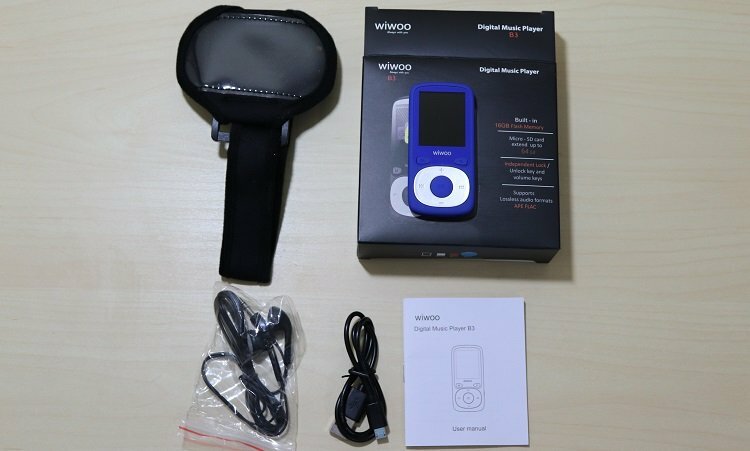 The Wiwoo B3 supports MP4. I tried this out. It worked but was very small and pixelated. I can’t imagine why anyone would want this feature; however, I can confirm that it supports the AMV format. Perhaps a home movie would be a good idea if you wanted this for your young child. That being said I can’t picture anyone having the patience to actually watch a full movie on this. I’ve seen this model advertised as handling up to a 128GB SD card. On the box, it’s listed as up to 64GB. Are you planning on putting a $20 to $30 micro SD card in a player that costs the same amount? That’s up to you. However, I don’t place a lot of value in the fact that Wiwoo included an expansion card here. I don’t plan on using it. If you’re using this for yourself, you may not care about this. However, the lock key is a great option here for kids. Give the MP3 player to your 3 or 4-year-old, lock the side, and put it on continuous play while you’re in the car or on a plane. Wiwoo lists the charging time as 2.5-3 hours. Upon opening the MP3 I was able to have it fully charged within 20 minutes. So, I’m not sure if it came substantially charged or it charged a lot faster than they thought it would. The B3 is lightweight and made of plastic. It doesn’t scream quality or anything. However, it doesn’t feel like it’s going to fall apart either. The menu is fairly intuitive with fast forward and skip buttons as well as plus and minus volume buttons. Moving down the menu is a bit odd as you need to press the forward button. This, in my opinion, would be better if it was the down volume button. To turn off the B3 you have to hold down the Play button. It took me a minute to figure this out. The B3 also seems to power down into a power saving mode after a bit of time. I installed two folders onto the MP3 and while they showed up under file browsing they were all clumped together under the Music section. Apparently, you can work with playlists here. However, what I really wanted was to just throw folders onto it that I could see in the music folder. In the end, I was totally fine just using the file section to browse. These earbuds are not ones I’d be willing to use. They’ve got that cheap metallic feel without any soft entrance for the ear. They’re big for me let alone my kids. I used another pair of earbuds for all of my reviews on this and don’t regret doing so. Basically, you’re getting an inexpensive MP3 player here and some throwaway earbuds. The armband that comes with this model is just fine. I’m a bigger guy and had no problem fitting this around my arm. It did just fine staying in place when running around. With my own earbuds, the audio sounded just fine. Wiwoo mentions that it has limited volume for kids; however, I was able to get the overall volume up very high with either pair of earbuds I used. That being said, you can use the lock button on low volume if you’re using this with your kids. At best, I would say that the FM radio was ok. I was hoping it would be crystal clear, but I was getting static on my the most popular stations in my area. If I was running outside, it was pretty good. Inside, this feature wasn’t really usable for me.